February 19, 2014 By Carlos C.
Guest contributor Rogelio Rodríguez shares his thoughts on Robert Wise’s The Haunting. I remember being alone in my room one night and seeing, with complete clarity, a severed head over the door frame. It was horrible. I must’ve been around eight. Today, the memory of this vision is as real as, for example, the face of the girl I fell in love with while riding the school bus. It was something that I lived. In the case of the girl, she was really there. In the case of the head… I suppose not. But it doesn’t change the fact that I saw them. Because let’s face it, who hasn’t walked faster at the sound of an “overheard” whisper? Or “felt” a strange coldness, “seen” an out-of-place shadow? You may be wondering why I bring this up. 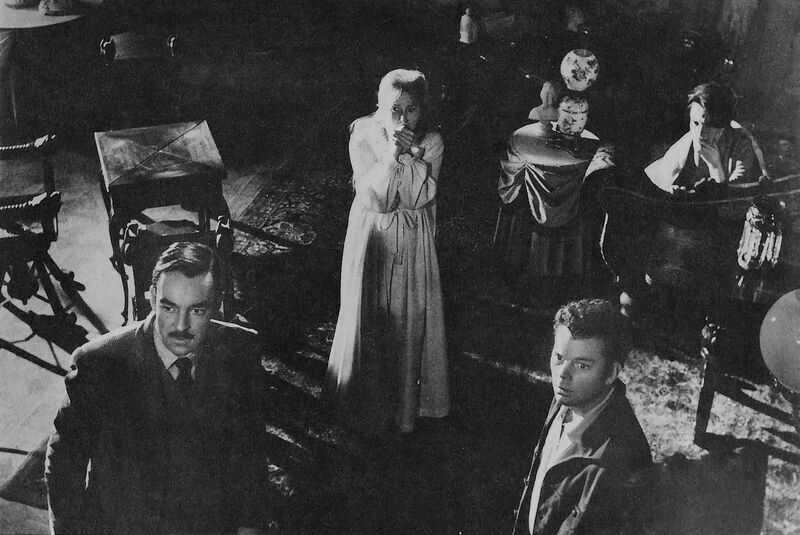 It’s because The Haunting, Robert Wise’s extraordinary horror film where a scientist (Richard Johnson) who studies paranormal phenomena invites a select group to spend a couple of nights at Hill House – a mansion said to be “haunted” or “possessed” – so he can observe the effect the house has over them. Wise, an undisputed master of cinema, directed The Haunting after West Side Story (1961) and just before The Sound of Music (1965). No small feat. Wise was a director of details: for him, the way an actor served himself a cup of coffee meant as much as the dialogue in the scene. Wise was the perfect choice to make Hill House an actual character. Set design and lighting create a heavy, gothic atmosphere… yet always believable. High-contrast black and white photography captures the darkness… yet you can see every detail. Theodora (Claire Bloom) and Eleanor (Julie Harris) face the unknown. The labyrinthine spaces in the mansion are used to amazing effect: just like the characters, you can’t find your place around. The halls and rooms don’t have regular angles. More than making you feel afraid, you feel uncomfortable. From there, you start feeling insecure. And then, finally, you’re really scared. Wise not only employs high-angle and low-angle shots, but also forceful close-ups. Are they from the house’s point of view as it watches and stalks its guests, playing with their emotions? In the mansion strange noises are heard, pockets of cold air blow, doors bang loudly. Mirrors in odd places scare the characters when they see their reflections. These are things that happen in all houses (specially if they’re old), but this one seems to do so at the right moments. Is there a conscience behind it? Could it be ghosts? Or is there someone else hiding in the house? The three guinea pigs are all well defined. Luke (Russ Tamblyn) is the sarcastic and skeptical future heir of the estate. Theodora (Claire Bloom) is the modern, and probably lesbian, extrovert. And Eleanor (Julie Harris) is the insecure spinster who has taken care of her sick mother for years, and who now finds herself, after her mother’s death, alone and close to having a nervous breakdown. Eleanor has never been able to socialize or have a life of her own. The invitation to Hill House becomes an incentive to keep on living. In fact, her relationship with the house is the backbone of the film: Eleanor is the protagonist, the mansion the antagonist. It almost seems as if the house wants to hurt Eleanor somehow. Of course, there’s no proof of this – it could be that poor Eleanor is just imagining things. This is, after all, her first adventure in the real world. Or maybe the house wants Eleanor to itself. At night, in the dark, Eleanor stares at the wallpaper in her room. She hides in bed, confusing the patterns with evil faces that stare back at her. Watching this scene made me think of children, and how they sometimes believe the shadows in their rooms are animals, monsters, or ghosts. Biologically, a child is supposed to be afraid of the dark: a newborn’s brain today is the same as 10,000 years ago. In the darkness, the shape of a branch or a lamp could be a snake. Being aware of sources of danger would keep youngsters conscious of predators and close to their parents, thus preserving the human race. And that is the genius of The Haunting. It exploits our most basic and instinctive fears. Our genes have not adapted yet to the security of the city, with all of its comforts. Children still look for monsters in the night, and when they grow up, they learn to control these impulses… but not entirely. For me, there are no ghosts in Hill House… or are there? All I know is that while I was watching it, the child in me kept fighting with the rational adult… and it was wonderful. P.S. There’s another film adaptation from 1999. I watched it and thought about comparing the two, but what’s the point. I also read Shirley Jackson’s novel. I liked it… but I think the film surpasses it.